Mountain Air Cabin Rentals has cabins located just miles from the Great Smoky Mountain National Park and embraces all the Smoky Mountains has to offer families, couples and those seeking adventure! The National Park was officially created on June 15, 1934. Franklin Delano Roosevelt dedicated the ceremony at Newfound Gap, a central point along the spine of the mountains that separates Tennessee from North Carolina. 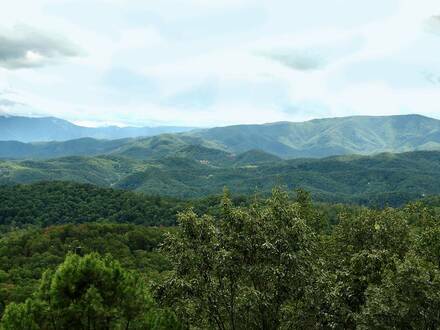 Unlike the vast western parks, the Great Smoky Mountains had been inhabited for some time and parcels of land had to be purchased from settlers. Pioneers crossed the mountains from North Carolina in the early 1800’s to reach rich, isolated valleys. Before them, the Cherokee lived from these lands. But by the 1920’s, the verdant southern Appalachians had been damaged by fires and stripped of most of their timber.A $5 million investment from famous industrialist John D. Rockefeller, along with the support of concerned citizens throughout the region, helped attain the final goal of the park’s establishment, protecting nearly 500,000 acres of land from development and creating a public space for the entire country’s enjoyment. There are four welcome centers located through the National Park. You’ll find one at Cades Cove, one at Sugarlands, and two others in the Oconaluftee and Clingmans Dome areas of the park. There are also informational centers outside the park where you can grab maps, self-guided tour books, and even a self-guided scavenger hunt instruction set! Be sure to swing by before you enter to find out which trails may be closed due to fire restoration work. Hiking in the Smokies is one of the favorite activities of many who visit. Hike Laurel Falls, Abrams Creek, Rainbow Falls, Grotto Falls along with so many more wonderful hiking adventures when you come and stay with us. It may be that you decide the Townsend and Cades Cove area is where you want to spend the day. Cades Cove is well known for its culture and history, along with wildlife sightings. Mountain Air Cabin Rentals has cabins located throughout the county so you can tell us what interests you and we can locate you in a convenient place to enjoy those activities. Laurel Falls: The hike to this 80-foot high waterfall is a 2.6-mile roundtrip hike, and is considered moderately difficult. Most people find it takes about two hours to get there and come back, so this is a great way to spend a morning or afternoon while you wait for the night life to start in Gatlinburg. Abrams Falls: The Abrams Falls trail begins in Cades Cove, so you get two activities for one! Drive about 4.8 miles into Cades Cove, then turn off into the gravel parking area and begin your hike at the wooden footbridge. This trail is a moderately difficult, 5.2-mile round trip that includes a stop at the beautiful Abrams Falls. LeConte: Looking for a challenging day hike that will lead you to some of the most amazing natural sights in the area? Hike the Alum Cave Trail to Mount LeConte! The roundtrip is 11 miles, but it’s strenuous climbing the whole way. You’ll see natural tunnels, caves, and some of the most panoramic views possible at Inspiration Point. Gatlinburg Trail: If you have young children or older relatives with you, this trail is a great choice. The entire route is paved, and allows dogs and bicycles. The round trip is just under four miles, and is relatively flat throughout. See the river up close and personal on this trail when you cross the footbridge! For families and couples and even groups the Scavenger Hike Adventure Book may be a perfect addition to your Great Smoky Mountain adventures. “Scavenger Hike Adventures” presents an ideal opportunity to involve everyone participating in your family reunion, corporate or group retreat, or family group to enjoy this activity. Follow the clues on Easy, Moderate and Extreme Hikes to find hundreds of hidden treasures on National Park trails. Be sure to check out the NPS’s tips on hiking safely in the Great Smoky Mountains! 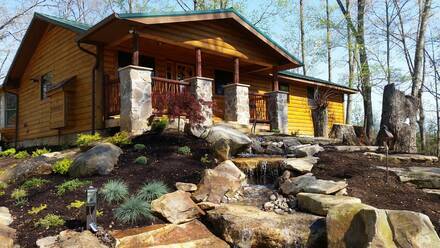 Have fun hiking the Smokies when you stay with us at Mountain Air Cabin Rentals. One of the best ways to get a closer look at the Smokies for family groups is to go for a scenic auto tour, or driving tour. This allows anyone in your group, regardless of age or physical ability, to enjoy a day surrounded by nature. These tours will allow you to drive through some protected areas where you’ll get to see everything from wild turkeys to black bears, if you’re lucky! Cades Cove is the most well-known auto touring area nearby our cabin rentals in Pigeon Forge and Gatlinburg. Take the 11-mile trip (one way) through the valley on a private road that allows you to drive as leisurely as you like to enjoy the view. There are many pull-over areas along the way, perfect for picnics, and you’ll also get to see some historic buildings and landmarks. The loop also has special hours that are only for pedestrians and bicyclists. Roaring Fork Motor Nature Trail is a slightly shorter trip, but the views are totally different. This is a great way to see the diversity of the Park! While Cades Cove lets you view the verdant rolling hills leading up to the mountains, Roaring Fork’s 5.5-mile (one way) drive includes waterfalls, flowing mountain streams, old growth forests, historic log cabins, and a historic grist mill. The best time to drive this loop is right after a good rain, when the stream is really roaring! If the view of the Smokies is what you are after, you can soak in stunning visions from the deck or balcony of your cabin rental! But when you head out into the National Park, be sure to look for Clingmans Dome and the Gatlinburg Bypass Overlook – both are perfect for taking in picturesque views all day long. 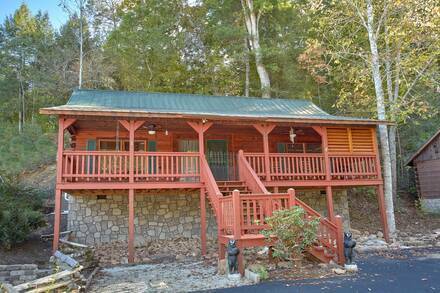 One of the most popular attractions of the Gatlinburg, Tennessee area is the Black Bear. People travel from all over the Eastern United States for an encounter with one of these animals. The symbol of the Smokies, the American Black Bear, is perhaps the most famous resident of the park. The Great Smoky Mountains National Park provides the largest protected bear habitat in the East. Though populations are variable, biologists estimate approximately 1,800 bears live in the park, a density of over two bears per square mile. During spring and summer and into autumn, most activity takes place during early morning and late evening hours, which can make a Smoky Mountain sunrise or sunset even more spectacular. Up to 5 cubs can be born during the mother’s winter sleep. Mothers with their cubs usually emerge from their winter dens in late March or early April. Often by the time of Gatlinburg’s famed Wildflower Pilgrimage in the Smoky Mountain National Park, mothers and their cubs can be seen in their terrain. After a day of fun in the National Park, you’ll want to relax in the most luxurious spot you can. 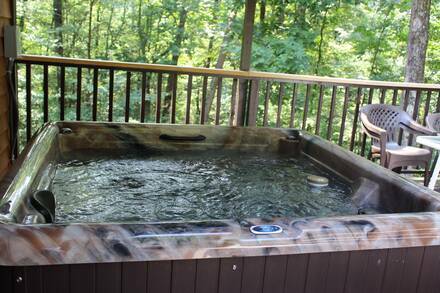 Why not take in a sunset over the mountains from your private hot tub overlooking the Park? 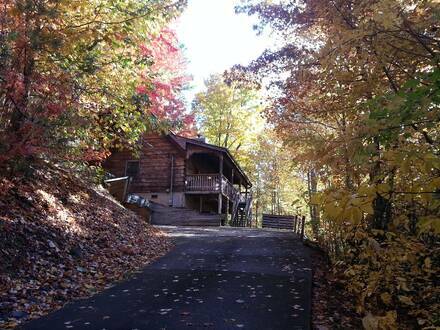 Find the Mountain Air cabin you love and reserve your stay today! Looking for all the info on open trails, auto touring locations, and more fun around the National Park? Find maps, information on closures, an easy trip planner, and more at the National Park Service’s Great Smoky Mountains homepage.